There are quite a few contenders for the title of "The Last Viking,". Certainly one of the most renowned of the later Vikings was Harald, son Sigur, known to history as Harald Hardarda, meaning Hard Ruler. Harald was born in 1015, and the time of the Vikings was already passing. Worshipers of the old gods were dwindling in number, with fewer men taking to the long ships to raid, preferring instead to settle, farm and trade. Moreover, a century and a half of Viking raids had brought wealth to the northern lands. This wealth became increasingly consolidated into fewer and fewer hands. These Scandinavian rulers like Harold Bluetooth extended their authority across vast areas, and promoted centralization of power through the monotheistic and hierarchical religion of Christianity. Harald's half brother of Olaf II (St. Olaf) of Norway was another such centralizer. He was ousted from rule by Cnut, who was constructing a northern empire from Denmark to England. Olaf's return to rule was contested by nobles not anxious to see the return of the heavy handed Christian. He died in the Battle of Stiklestad in 1030. The young Harald, all of 15, survived and left Norway to seek his fortune in the east. For a while he lived among the Rus but the road to glory and fortune led to Constantinople and the famed Varangian Guard. Harald's tenure in the Empire's service as entered the realm of quasi-myth. He fought in Sicily and Syria and broke open an Arab castle by unleashing upon it a flock of flaming birds. He also gained entry into another enemy fortress through a variation on the old Trojan horse trick. While these stories are mostly fanciful, they do tell us that Harald was more than just a strong man with an axe. Where possible, he used trickery and his wiles to win battles and preserve his men's lives. After running foul of the jealousy of the man-hungry Empress Zoe (another tall tale no doubt), he returned to Norway around 1045. The kingdom was ruled by his nephew Magnus, illegitimate son of Olaf. His demand to share power as co-ruler was granted but Magnus conveniently took ill and passed away a short while later leaving Harald the sole ruler. As king, his main policy seemed to be to conquer other kingdoms, and pay for it with high taxes on his own people. When Northumbria revolted in 1065, Harold Godwinson of Wessex appeased the rebels and removed his brother Tostig as earl. Tostig sought allies in Flanders among his wife's people, but he eventually ended up in an alliance with King Harald. After Edward's death, King Harald saw England as a prize ripe to be picked. His preparations were extensive; he landed in England with well over 200 longships. Harald and Tostig met the earls Morcar of Northumbria and Edwin of Mercia at Fulford, routed their forces and occupied the town of York. Harold quickly mobilized and met Harald and Tostig with their warriors surprised and unprepared. In a most likely invented story of the pre-battle exchange, Harold offers to restore Tostig's lands if he abandons the invasion. When asked what he will give Harald, Harold says "Six feet of English earth, maybe more since he is bigger than the average man." 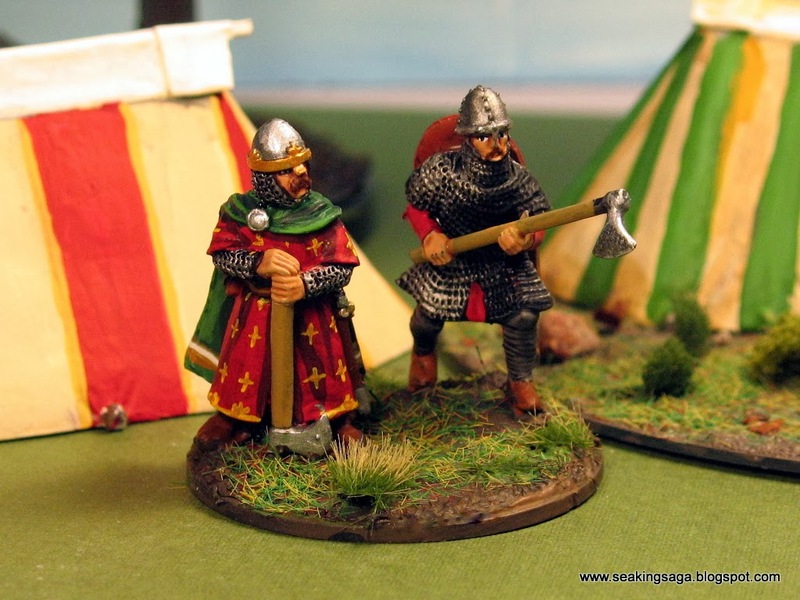 Two excellent miniatures are marketed for Harald, both depicting him at different points in his life. 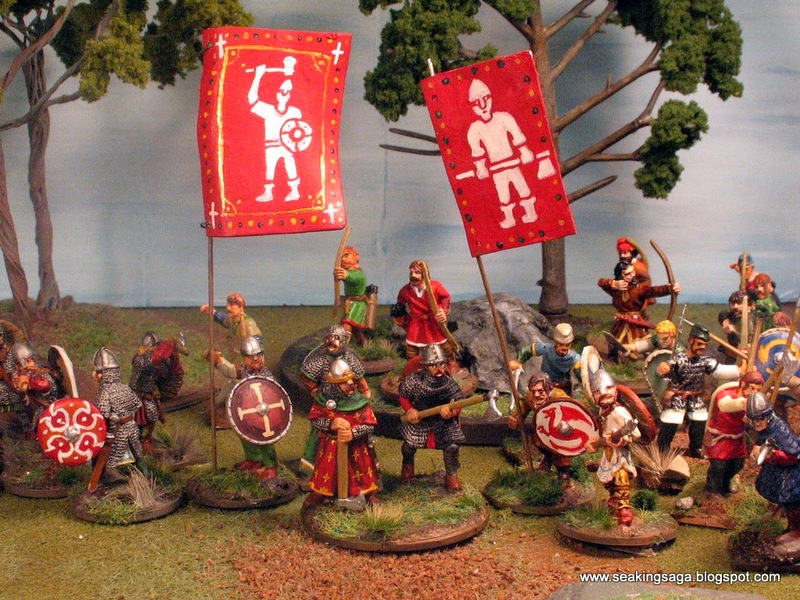 Crusader Miniatures produces a command pack for Varangians in their Byzantine line, with the leader easily able to represent Harald on the table. For the older King Harald, Gripping Beast's Harald is visually impressive but almost a scale breaker. 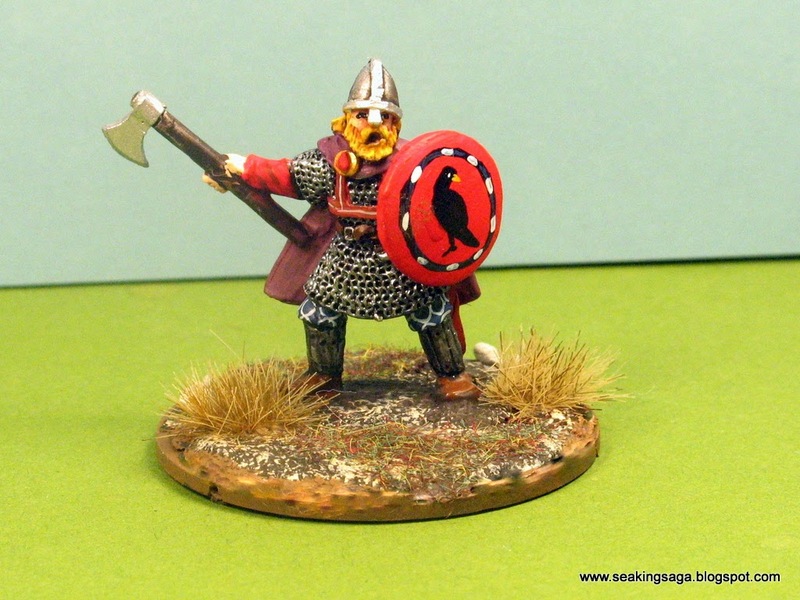 While the Norse were taller than the average, and Harald was taller than the average Norseman, this mini stands 36 mm from foot to top of his head. As the last Viking invader, there's no shortage of historical fiction about Harald or in which he appears. I have not read any of the half dozen or so books I have identified that center on Harald. Here are two recommendations for books in which Harald is a suporting character. Harald is a significant part of the the last book of Tim Severin's Viking trilogy. Without meaning to do disservice to the series, it is in some ways an eleventh century Forrest Gump. The main character is an illegitimate son of Leif Erikson, who manages to encounter every important historical figure from Vinland to Constantinople. Implausible, but great fun. Harald appears as a slightly dim and oafish Varangian in Thomas Holt's Meadowland, a colorful novel in which two older Varangians recount their experiences travelling to Vinland. 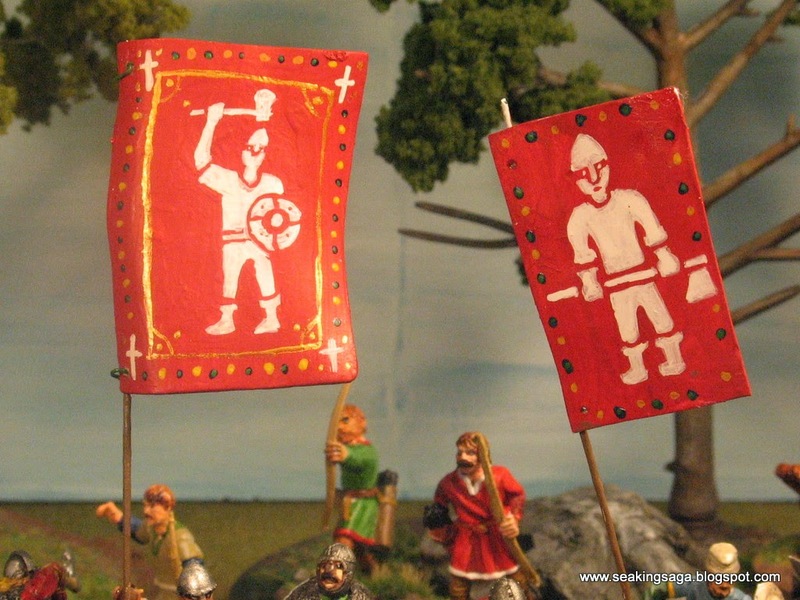 In reading about Harold Godwinson, one of the more fascinating and frustrating details about Harold the warrior was his banner. Fascinating, because of its reported design and beauty; frustrating, because no depiction or illustration of it exists. According to the scant descriptions, it was an image of warrior embroidered on a cloth (red?...blue?) with gold and jewel ornamentation. The Bayeux Tapestry does not depict it, showing only Harold's red dragon of Wessex. The fate of the fighting man banner after Hastings is unknown. Most likely, it fell with Harold on the hill and was taken by the Normans. Some say that it was sent as a gift to the Pope Alexander II as thanks for lending William a papal banner for the invasion. It could just as well have been squirreled away by survivors and lost to the ages. The coloring was lifted from some reenactors because I thought the white on red was very striking for a scale reproduction. I made the banner by rolling out a piece of green stuff like a tiny pizza crust. After it hardened, I trimmed it square, and sanded it with very fine (400 to 800) sandpaper. I hand painted the fighting man with acrylics. I finished the one on the right first, but was a bit unhappy with the lack of dynamics in the pose. I then did the one on the left with the raised axe. I still probably prefer the first figure, but I learned on the second one how to drape the green stuff before it hardened to simulate a billowing banner. 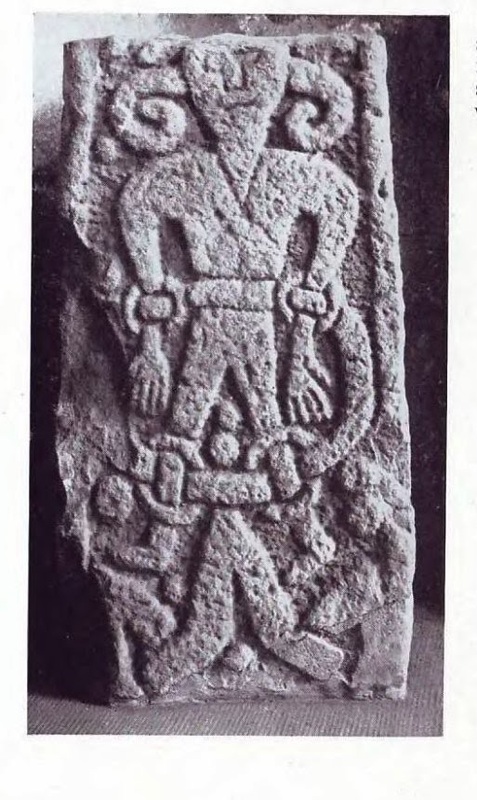 A book on Anglo-Saxon art provided me with some figure inspiration, such as this piece of stonework from Shaftsbury. Next time, a look at the third contender for the English throne, Harald Hardrada. The death of the childless Edward the Confessor in January of 1066 presented England with a crisis of succession. Lacking any heir, the three rulers - Harald of Norway, the newly enthroned Harold of England and Duke William of Normandy - pursued their claims on the battlefield, with William emerging final victor... at least according to the oft told history. In actuality, there was a perfectly legitimate blood heir to the throne, Edward's young grand-nephew Edgar. The reason why Edward did not become king and Harold did is largely a matter of his young age and the power of the Godwin family. Harold's father Godwin was Sussex thegn of some, but not great importance in the time Ethelred the Unready, Godwin readily adapted to the conquest of the Dane King Cnut in 1016. By the time of Cnut's death in 1035, Godwin had become the powerful Earl of Wessex. After brief reigns by two of Cnut's sons, the earls of England invited Ethelred's son Edward back from exile in Normandy to reign as king in 1042. Edward chafed under Godwin's attempts to control him, and a dispute in 1051 led to the entire family's banishment from the kingdom. Harold, the second son of Godwin was born in 1022, and already and earl in his own right at the time of his family's banishment in 1051. He went to Ireland, where he had friends and allies, which the Godwin's used to force their restoration the following year. Following his father's death in 1053, Harold took on his role as the wielder of real power in England. As leader of the king's army, in 1062 and 1063 he decisively dealt with Welsh raiders by boldly marching into the Welsh lands. Such was the pressure he placed on the Welsh, that Gruffud's own allies killed him and sent his head to Harold. Less understood is the trip that he made to Normandy in either 1064 or 1065 (the sources are in dispute). Either by intention or accident a boat bearing Harold landed in Normandy and Harold became the unwilling guest of the Duke for a few months. Harold's Normandy visit ended with a much debated incident in which the English earl swore fealty to William, supposedly upon some holy relics. Immediately following Edward's death in 1065, the English witan - a council of Earls, met and conferred the crown on Harold. It was done rather quickly, so much so that he was coronated even before Edward's burial. Victorian era historians imagined the witan as a precursor to Parliament, with Anglo-Saxon England a proto-Constitutional monarchy, only to be corrupted by the autocratic despotism of the Normans. In reality, the exact function and role of the witan is rather confusing, and while rarely used it was mainly a tool of the richest and most powerful earls, in this case Harold. However, Harold was probably the most capable ruler of all the claimants to the English throne. He was literate and had progressive tendencies. He put good governance ahead of family when the northern part of the realm rebelled against his brother Tostig's misrule. He was well traveled and had diplomatic links as far as Rome and Russia. As a commander, he defeated a variety of opponents including Norse, Welsh, and Bretons, sometimes in their own territory. But a string of victories cannot make up for one staggering loss. 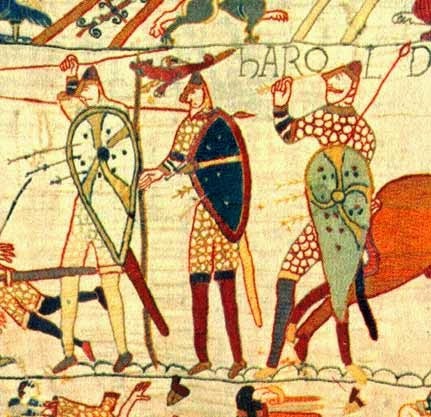 After holding together a larger, but tired and less disciplined army, against the Normans on the 12th of September 1066, Harold was felled in battle and his army routed. From the Bayeux Tapestry to later artistic representations, Harold is almost always represented as a physically impressive man, with brown hair and a mustache. 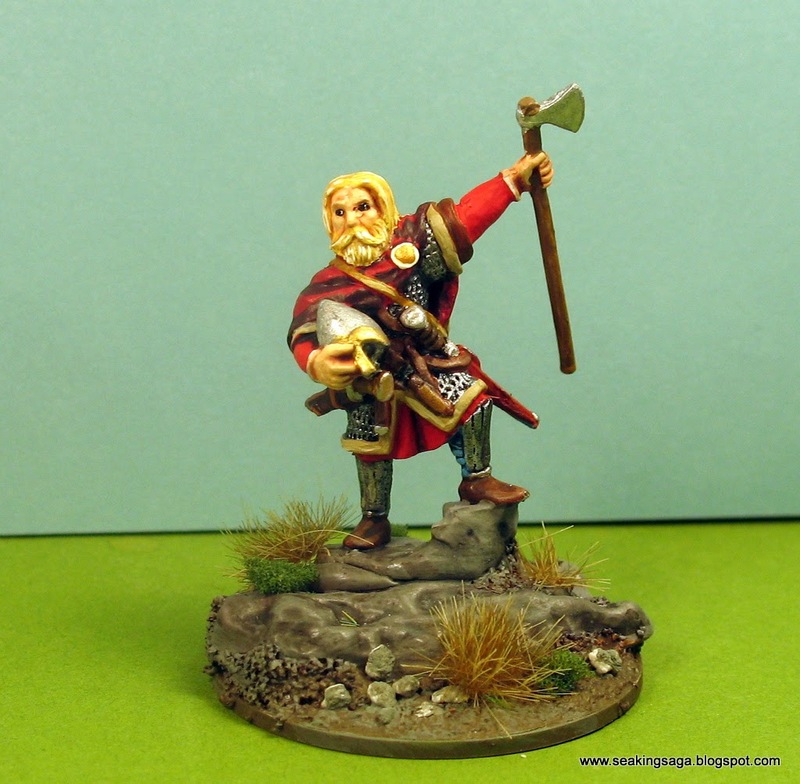 Gripping Beast and Crusader Miniatures both produce figures for Harold that adhere to this tradition. The two shots below are Crusader's Harold, based along with an axe bearing housecarl from Conquest Games. 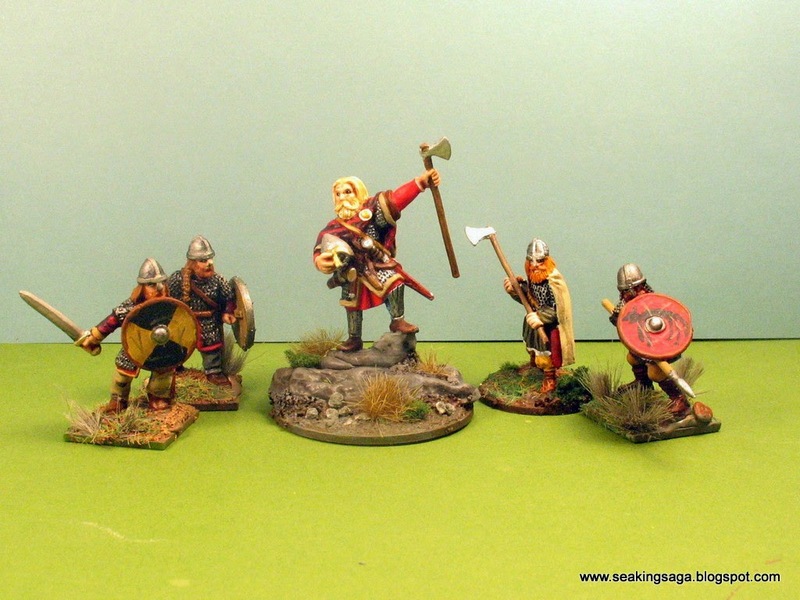 Gripping Beast sells a pack of Harold with his brothers Gyrth and Leofwine, all three of whom were killed at Hastings. This is the promo pic, which looks like a nice purchase. His face was suddenly suffused with angry blood again and Quint wisely chose not to pursue the subject. If one wants to get an impression of the high regard that Victorian English held for Harold, a good place to look is G.A. Henty. A tremendously popular Victorian writer, he is not well known today. That is a shame because Wulf the Saxon is an example of the "boy's own" genre that holds up to this day. Like the previous book, the main character is a young Saxon, Wulf in this case, who has a fly on the wall perspective on the events leading up to Hastings and the aftermath. 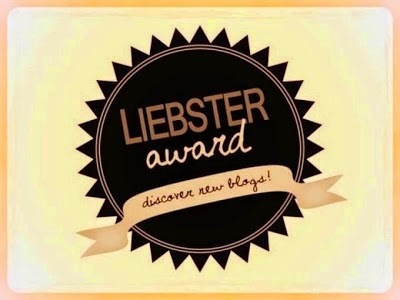 As an added bonus, a free audio version is available at the public domain repository Librivox. 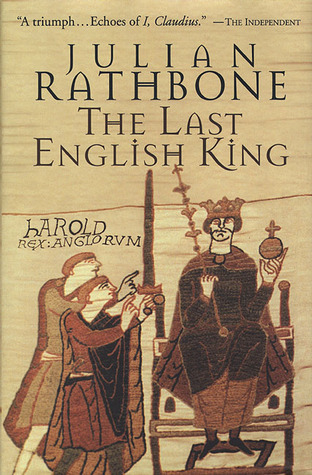 Most of my research on Harold comes from Harold: The Last Anglo-Saxon King by Ian W. Walker. It is a rare modern biography of Harold, and generous to his legacy. Walker nicely balances the difference between a scholarly work and a popular history. Today's Gripping Beast newsletter contained loads of good news for fans of SAGA, some expected and some unexpected. Besides historical reasoning, I am also basing my prediction on Gripping Beast's current line of Crusade era miniatures, which seems to support multiple Arab armies of Turkish, African and Spanish composition. Another possibility is releasing two Crusader factions, the Franks (those led by Robert of Toulouse, Baldwin and Robert of Normandy) and the Italian Normans (led by Bohemond and Tancred). I'll further predict that Bohemond, El Cid and Yusuf ibn Tashfin (Ben Yussuf) will be Hero characters. While the Crescent and Cross has been talked about and promised for over a year now, this other bit of info in the newsletter was a certainly a surprise. Plastic Saracens! Also slated for a Salute release, this box of 40 plastic warriors can fill out your ranks with archers (16), javilines (16) or spearmen (up to 32). 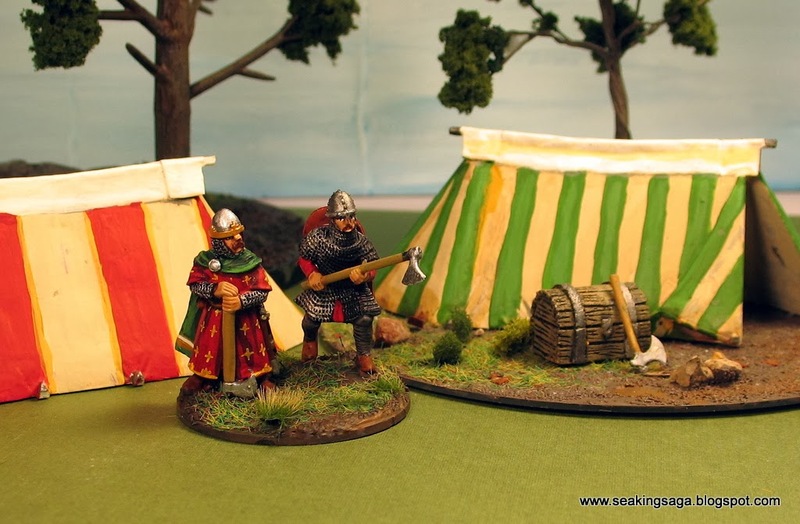 Excellent, no more of conversions of Conquest Normans.